Once they've entered play, Ajur and Boratus are little more than petty thieves. 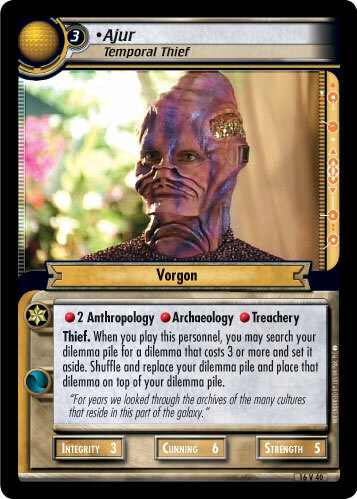 Sure, together they provide a double serving each of Anthropology, Archaeology, Security and Treachery, skills that are always handy in a Thief deck, and thanks to their Treachery and keyword, it's easy to boost their base Cunning of six to double digits with the likes of the Fortune (Raider for Hire), Jean-Luc Picard (Galen) and Pickpocket. What distinguishes the infamous Vorgon couple from similar personnel, though, is their powerful entrance. When either of the Vorgons is played, you may exploit their knowledge of the future to look through your dilemma pile and put a dilemma that costs '3 or more' (Ajur) or '3 or less' (Boratus) on top of it. Keep in mind that in the game it's best to play them on separate turns, as the shuffling will prevent you from setting up a one-two-punch dilemma combo. 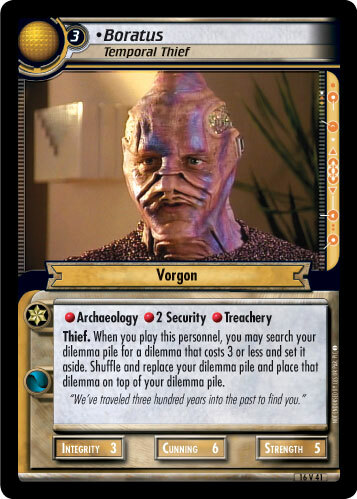 Still, their abilities are extremely versatile: Boratus helps to have cheap dilemmas like Outmatched or Fesarius Bluff ready when there are already several dilemmas under a mission; or maybe you want to have that Tactical Disadvantage ready when your opponent is going for the space mission; a Timescape at the top might also give your opponent a headache. Ajur, on the other hand, can dig for those massive calibers like Whisper in the Dark or Where No One Has Gone Before. Even with only a single copy in your pile, you can make sure to have them ready when you need them. Knowing that there is, for example, a Tsiolkovsky Infection waiting, your opponent might decide to change his or her game plan and go for a planet mission first (where you will hit him with one of your three Necessary Executions). As a bonus, putting a four-or-more dilemma on top of your pile is also a nice way to take the steam out of my favourite splash personnel, Malcolm Reed (Weapons Expert).